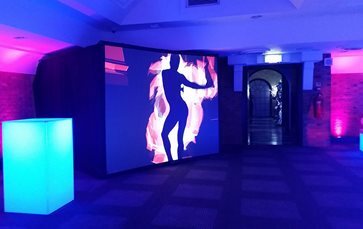 The Digital Box is a striking interactive digital installation that presents audience with their reflected silhouette as a vivid digital effect. The silhouette-effect emanates beautifully from the audience’s body and is responsive to their movement, allowing them to play and interact with their own reflection. 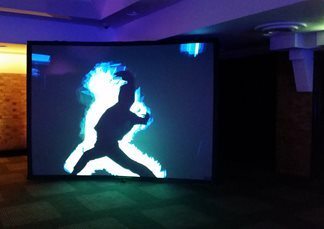 So if you are looking for something totally unique for your event, then look no further than this Digital Box! It’s perfect for both Corporate Events and Private parties. 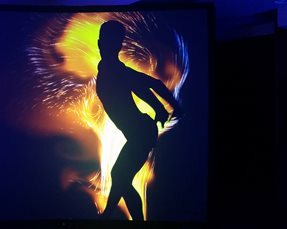 This installation also allows for pop up shadow dance shows, in which talented performers dances on the opposing side of the digital surface to create beautiful shapes using their body and the visual effects. Existing effects for the installation are fire, ice, water, particles, smoke and geometric shapes. Bespoke effects can be developed on request. The Digital Box team creates interactive digital installation experiences that engage audiences in movement and play. Presenting audiences with digitally enhanced motion-sensitive images of themselves, inviting spectators to set aside inhibitions and freely interact with vibrant visual effects. Front projection can be run for 5h. Shadow pop up performances: 3x25min passes. The performance time can be extended if required. ★ Invites spectators to freely interact with vibrant visual effects.